Osaka Shinsekai (新世界) is a shopping district located in the south area of Osaka city. Tsutenkaku Tower ( 通天閣) is the most popular feature of Shinsekai. It has the old style shopping district which has not changed for over 30 years. At he main street, there are many Kushikatsu, skewered pork cutlet, restaurants are opened. 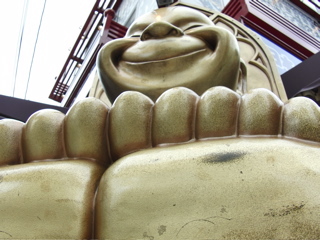 Biliken-san is the most famous feature of Dotonbori located on the top observatory of Tsutenkaku Tower. There are many theaters and restaurants. Festival Gate is the another tourist attraction in Shinsekai. Tsutenkaku is one of the major symbol of Osaka. It is 100m high and has an observatory where you can see great view of Osaka City. There are gift shops, restaurants and event hole. On the observatory, there is the statue of Biliken. Biliken-san is the main character of Luna Park. It is also known the legends that when you touch his feet, you get luck from Biliken-san.